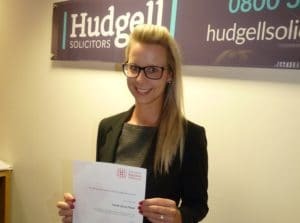 Newly qualified Sarah Moor says her passion and love of the legal profession has been key to her becoming the youngest fully qualified solicitor with personal injury and medical negligence specialists Hudgell Solicitors. The 25-year-old from Beverley, East Yorkshire, has received her practising certificate in the senior courts of England and Wales from the Solicitors Regulation Authority almost three years after joining the firm for experience. In total Sarah has spent seven years working towards the qualification, graduating through law school and completing a legal practice course alongside a training contract with Hudgell Solicitors with flying colours. Now part of the medical negligence department, Sarah is targeting further rapid progress in her career, but says it is was the opportunity and continued support of her employers that has given her the platform to succeed. “I was absolutely delighted to finally become a fully qualified solicitor as it has been a long and challenging seven years to reach this stage, but it certainly feels worth all the hard work now,” she said. “I am really grateful for the opportunity I was given at Hudgell Solicitors, as I was able to come in and gain experience after studying at university, and that gave me the opportunity to learn the role and show my abilities. “I know so many people who have studied law but have then struggled to get training contracts at firms. Many require you to go through lengthy interview sessions to even be considered, but Hudgell Solicitors gave me the chance to come in and work alongside experienced people. “It was therefore a different route for me as I was given my chance to impress after completing my degree in the new claims team in Hull. After 18 months working with the team I was offered the training contract, which was the opportunity I had been seeking. With a natural passion for the subject, Sarah achieved an A grade in Law at A-Level , 1st class honours in her law degree when graduating from the Nottingham Law School at Nottingham Trent University in November 2013, and a distinction in her Legal Practice Course. She gained experience in three areas of work during her training contract with Hudgell Solicitors, handling cases in clinical negligence, claims against the police, and criminal injuries compensation, work which saw her spend some time in the firm’s Leeds office, finally receiving her full qualification on September 1, 2016. Sarah says it has been a long journey to where she is today, and believes other young people now starting out on their journey to qualification need a number of qualities to succeed. “It’s not an easy route to becoming a solicitor and there is a lot of hard work and dedication required,” she said. “There were a few people who started with me who dropped away and looked for other careers, but if you have a genuine interest in law and a real desire to make it, it is certainly achievable and a great career to pursue. Currently handling medical negligence compensation cases ranging anywhere up to around £25,000 in value, Sarah has her sights on handling complex cases involving higher settlements and longer term support packages for clients in the future. “Long term I would really like to be handling higher value cases involving serious injury, as the work we do for clients has a long term impact on their quality of life and rehabilitation. Simon Wilson, senior solicitor at Hudgell Solicitors and head of the new claims team where Sarah gained her first experience of life at a legal firm, said: “Sarah is a great example to any young person considering a possible career in the legal profession. “Complete dedication and a passion for the job has taken her to where she is today and she has a great career ahead of her. “We pride ourselves on being as supportive as possible to young people who are seeking a legal career, and our door is open to those like Sarah who have real passion, commitment and desire to forge a successful legal career. “We have been delighted to give Sarah her opportunity, and to provide her with a route towards becoming a fully qualified solicitor which has enabled her to learn valuable skills and develop as a solicitor whilst studying for her qualifications.